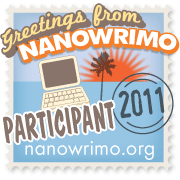 It is now two hours until NaNoWriMo starts! I am bursting with excitement and nervous energy. Tomorrow I will be sitting drinking coffee and writing like demons are pursuing me across plains of lava; in other words as fast as humanly possible to get a great start. I have an arc of a story. It has characters. Love interests (yes plural – holy crap!) It has locations and I can actually smell it now. This much neglected blog will now become further neglected and I am sorry to my handful of loyal readers for that, but a larger cause and a bigger quest is at hand. It is nearly November. In fact there are fifteen days and counting left of October. This year this means one important thing. National Novel Writing Month. I have started my preparation. If you can call staring into the middle distance and hoping a story arc whacks you over the head, preparation. This year I have themes. This year I will start on the first day. This year I will write every day. This year I have some characters. All of these little preparations are a big improvement on last year. Last year I didn’t start until the first week was almost over. I had no characters. I did not write every day. And I only wrote a pathetic 3260 words. I have high hopes this time. I am better prepared. I have a child who reliably sleeps through the night. I have a day off a week. I have a couple of story ideas. I’ve made some notes. I am participating in this grand writing collective frenzy for one reason; to test myself. To see if I can do it. To see if I have enough story writing in me to write something sustained. 50 000 words. It is a tough ask. It is 1 667 words a day. Each and every day for a month. We shall see. In the meantime, I will continue to hope for a story arc or a brilliant idea. I have still got a few days.